FAYETTEVILLE, Ark. -The Diamond Rebels’ SEC road trip continued with a visit to division foe Arkansas. No. 21 Ole Miss entered the weekend 18-8 overall and 3-3 in the Southeastern Conference. The No. 8 Razorbacks brought in a record of 21-4 overall and 5-1 in league play. 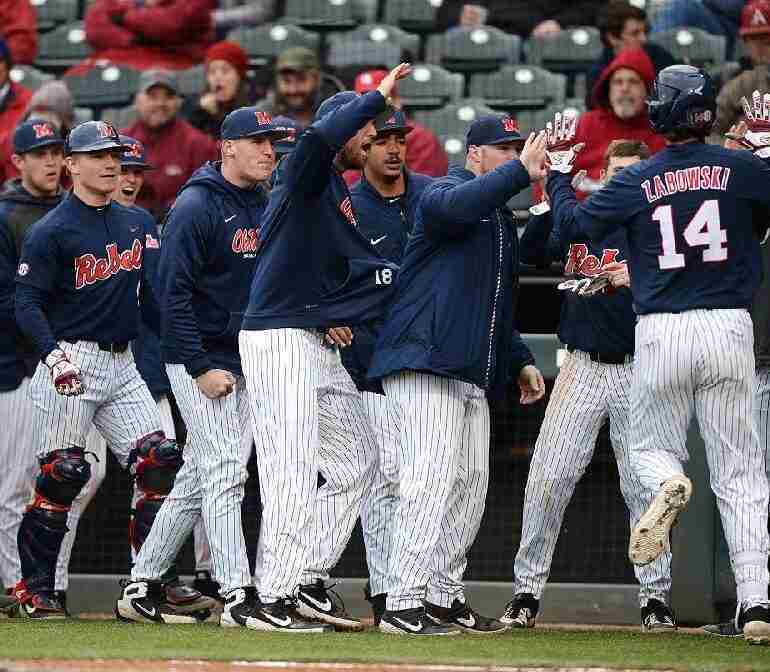 After splitting the first two games, Sunday’s contest would be a back-and-forth affair that ultimately saw the Rebel bats overpower Arkansas’ pitching to give Ole Miss a 2-1 road series victory. The Rebels improve to 20-9, overall, and 5-4 in the ultra-competitive SEC West. Here’s your weekend wrap-up of the huge series victory. Finding themselves down early, the Rebels would have to battle from behind after Arkansas scored two runs in the first inning and one run in each of the second and third innings to take a 4-0 lead over Ole Miss after three. The Rebels would cut the Hogs’ 4-2 lead in half in the fourth inning. Junior Thomas Dillard stroked a one-run double, scoring shortstop Grae Kessinger who had singled to lead off the inning. Cole Zabowski’s ground-out then plated third baseman Tyler Keenan. Arkansas, however, would extend the lead to 5-2 in the fifth inning. For Ole Miss pitcher Will Ethridge, it was his toughest start of the year as the top-10 ranked Hogs notched five runs (four earned) off of seven hits in Ethridge’s five innings of work. Arkansas was also the beneficiary of two walks. After the game, head coach Mike Bianco was supportive of his junior pitcher. “I thought he was really good,” Bianco said of Ethridge. Entering in the sixth inning, Oxford native Houston Roth took the mound and held the Razorbacks off the scoreboard for the remainder of the game. Roth went three innings, allowing just a single hit while recording five strikeouts. With his team down 5-2 in the ninth, Ole Miss catcher Cooper Johnson cut the lead to two with a no-doubt solo home run over the Arkansas bullpen in left field. “We had opportunities offensively,” Bianco said of the Rebels’ production in game one. “We just missed the big hit tonight. [We’ve] got to flush this one and be ready tomorrow,” he added. In the second game of the series, Ole Miss scored first as the Rebels were able to string together three singles in the third inning off the bats of Jacob Adams, Grae Kessinger and Tyler Keenan that scored a run and gave the Diamond Rebs a 1-0 lead. Arkansas would battle back to score three in fourth inning, putting the Rebels behind for the second day in a row. But Tyler Keenan single-handedly cut the Razorback’s lead to one in the fifth inning when he stroked his eighth home run of the season and notched his 44th RBI. The Rebels tied the game at 3-3 in the sixth inning off the bat of Cole Zabowski who blasted a shot to deep center field in Baum-Walker Stadium. His homer was estimated to be well in excess of 400 feet. In the ninth with the scored still tied at 3-3, Ole Miss freshman Kevin Graham led off the inning with an infield line-drive single that trickled out of the Arkansas third baseman’s glove as he hit the ground trying to complete the catch. Anthony Servideo successfully sacrificed Carl Gindl, the Rebel’s pinch-runner, into scoring position. And then with two outs, Grae Kessinger doubled home Gindl for the go-ahead run that would prove to be the difference in the game. Freshman Doug Nikhazy pitched 5 2/3 innings for Ole Miss. His line included: five hits, three runs (three earned), five walks, and six strikeouts. Because the game was tied when he left, Nikhazy was not eligible to get the win. Austin Miller came on in relief of Nikhazy and struck out four, allowing only one hit in 2 1/3 innings. The junior from Iowa earned the win and moved his record to 2-0 on the season. “In this league, the Southeastern Conference, the No. 1 baseball conference in country, there’s such a thin line to being on the right end of the scoreboard or the wrong end, and it comes down to just a few pitches,” Bianco explained. “Did you get the timely hit? Did you make the pitch in the field? Doug was able to do that, and certainly we had some timely hits.” he continued. That's a combined 9️⃣ K's for @wild_thang_50 and @dougnikhazy today! In the ninth inning, holding a slim one-run lead, Ole Miss called on All-American closer Parker Caracci to keep the Hogs at bay. The first out Caracci recorded did not come without some controversy. With two strikes, the Razorback lead-off batter Nesbit was ruled to have leaned into the pitch. In a 2019 NCAA rule change, batters who intentionally move into a pitch are given a strike regardless of the location of the pitch. Across the nation, the rule is unpopular with fans, players and coaches. Despite objection from Arkansas head coach Dave Van Horn and a video review from the SEC office, the call was upheld and the Razorbacks’ batter was ruled out by strikeout. Caracci promptly struck out the second batter and then induced a deep fly-out to right field to end the game. Caracci’s 1-2-3 inning earned the redshirt junior his sixth save of the season. For the second game in a row, Ole Miss scored first, notching one run in the first and another in the second that would give the Rebels a 2-0 lead. In the first, Grae Kessinger scored on a Cole Zabowski single.
.@Cole_Zabowski stays hot, pulling a base hit through the right side to give the Rebels an early 1-0 lead! The second inning saw Kevin Graham get things started with a solo home-run off the light pole beyond the Ole Miss bullpen in right field. The Arkansas half of the second inning featured Anthony Servideo “flashing the leather” and Cooper Johnson showing off his cannon of an arm. To lead-off the inning, Arkansas center fielder Dominic Fletcher drove a ball deep to right field where Servideo went above the fence to rob Fletcher of a home run in a potential SportsCenter Top 10 play. Later in the inning with two Hogs on base and only one out, Johnson gunned down Arkansas’ Jack Henley on his attempt to steal second. After a scoreless third for both teams, Arkansas tallied two in the fourth to tie the game at 2-2. But a determined Ole Miss squad answered right back in the fifth inning with a pair of runs of its own. Cole Zabowski singled home two more runs, plating Tyler Keenan and Thomas Dillard and giving the Rebels a 4-2 lead. Bring 'em home @Cole_Zabowski! Z-Bo now has three RBI already today. Rebs back on top. As one would expect, the No. 8 Hogs would not go down without a fight. Arkansas struck again in bottom of the fifth, notching three runs to take a 5-4 lead over Ole Miss. Once again, however, the Rebels’ lineup responded to the challenge as Ole Miss scored three in the top half of the sixth. Keenan singled home Ryan Olenek, followed by Zabowski who singled home Kessinger. Then, Graham’s ground-out scored Dillard. The Rebels scored another three runs in the seventh inning. Anthony Servideo singled up the middle to lead off the seventh. After stealing second and advancing to third on a throwing error from the Hogs’ catcher, Servideo scored on an Olenek single. Kessinger soon doubled down the left field line, pushing Olenek to third. The last runs of the inning and game were scored when Dillard’s single to right field scored Olenek and Kessinger. Freshman Gunnar Hoglund started the deciding game for the Rebels and went three innings, giving up three hits and two earned runs. Conner Green came in and pitched 1.1 innings and Zack Phillips put in 2/3 of an inning of work. In the sixth, junior Tyler Myers took the mound for Ole Miss and shut down the nationally-ranked Hogs for the final four innings, allowing no runs on two hits and striking out four. Myers earned the save, his first as a Rebel. “This win was really good for us,” the Texas native said. He was asked what his mindset was going in to such an important appearance on the mound. “Believe in myself and believe in my team,” he responded. “He just made pitch after pitch,” Coach Bianco said of his junior pitcher. The Rebels return home for the annual “School Day” game on Tuesday where youngsters from the area will head to Swayze Field to see Ole Miss take on North Alabama at 11 a.m. The Diamond Rebels will then welcome No. 21 Florida this weekend. The Gators are coming off a series sweep of Alabama. Action at Oxford-University Stadium begins at 6:30 p.m. Friday; 7:00 p.m. Saturday; and 1:00 p.m. Sunday.